After a week exploring Siem Reap and Angkor Wat I journeyed onward to Cambodia’s capital city, Phnom Penh. Traveling between the two cities involved an 8 hour bus ride through a mostly under construction highway, a rough ride to say the least, but still a great way to see the countryside. After a long travel day it was nice to check into the InterContinental Phnom Penh and unwind. 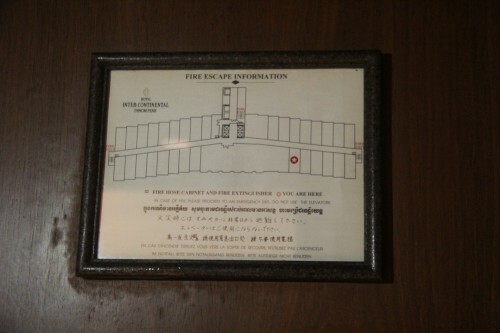 The hotel itself is not located within the main tourist district of the city, and involved taking a 30 minute tuk-tuk ride from the bus station to the hotel. 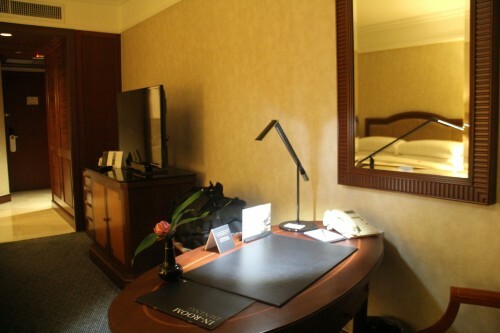 I booked a Deluxe Room and the night was free since I booked it with IHG’s Best Rate Guarantee. I didn’t arrive to the hotel until late evening and upon check-in I received a room upgrade to a Premium Room, which from what I can tell, essentially a standard room, but included a fully stocked free mini bar. The check-in process was quick as I was the only guest at the reception counter, but actually felt the receptionists were a bit pushy as there were three receptionists interacting with me. Although polite, one receptionist repeatedly hinted to me that I should review the hotel after my stay on IHG’s website. Communication was easy, but when I was informed I did not have breakfast included and asked was asked if I wanted to have breakfast at the hotel I said ‘no.’ The receptionist asked, “you don’t eat breakfast” to which I responded “I normally like to try out local cafes,” which is true if it’s not already included in the rate. On Trip Advisor the hotel is ranked #33 among hotels in Phnom Penh and has a 83% recommendation from reviews. 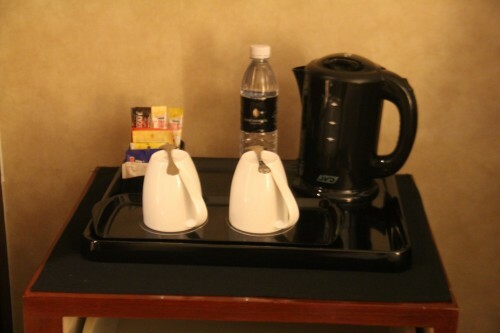 The hotel is located fairly far from the tourist area of town and seems much more geared towards business travelers. 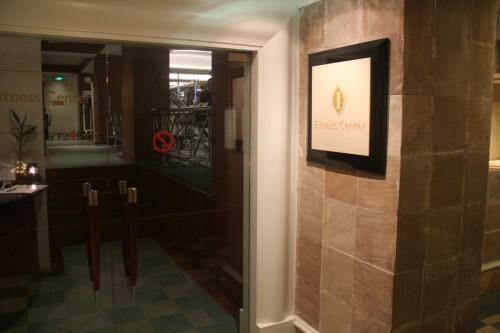 In fact, I would say that there is nothing of interest within walking distance of hotel other than a shopping mall. On the other hand the hotel is centrally located within the city and closer to the S21 prison and Killing Fields—only about 10 minutes to S21 and 30 minutes to the Killing Fields. Both of these were high on my list of things to do while visiting Phnom Penh and however somber are highly recommended. The hotel is located at the intersection of two main streets with heavy traffic, but the hotel is set back from the street and has a large garden space along the entrance. To reach more of a cafe and restaurant area of the city it is only a short tuk tuk ride away and you can get almost anywhere within the city for less than $5 one-way. I was assigned a Premium Room, room number 1328, with a city view on the 13th floor. In general the room was fine, it was spacious and clean–but far from anything jaw-dropping. 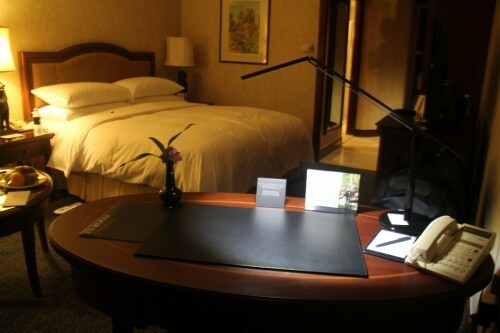 It had a king bed, small love seat sitting area with table, small work desk, and a large flat screen TV. The room also had WiFi that was free with Platinum status. The room had bright colors and a very comfortable king size bed. When I arrived the room had already been turned down. All of the rooms at the hotel have a view, but differ by having a street side view or one out the back of the hotel. My room faced the front of the hotel and it was quite entertaining to watch the crazy traffic frenzy and drivers below on the street. 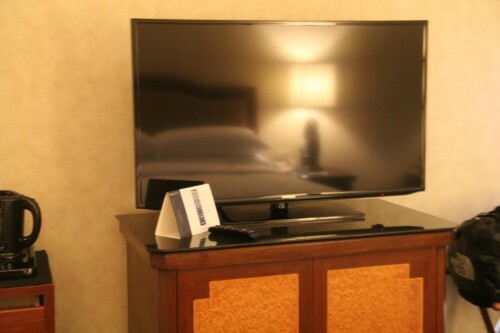 The room featured a large flat screen TV that sat above the mini bar. There were close to 40 cable channels with many in English for anyone that enjoys a movie at night. 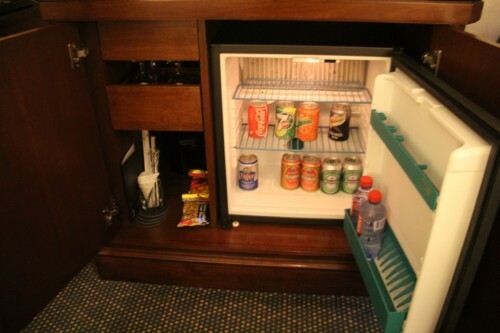 The Premium Room included a free mini bar that had several brands of beer, sodas, water, and white and red wine. A few bags of snacks were also provided that included nuts and chips. 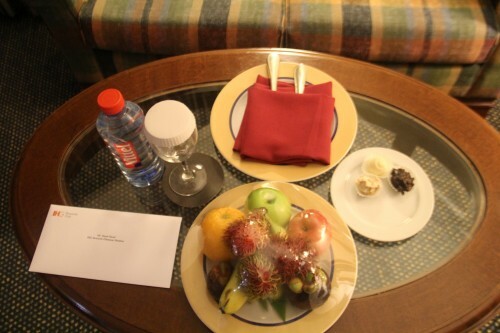 The Platinum welcome gift included a plate of fresh local fruit and truffles. 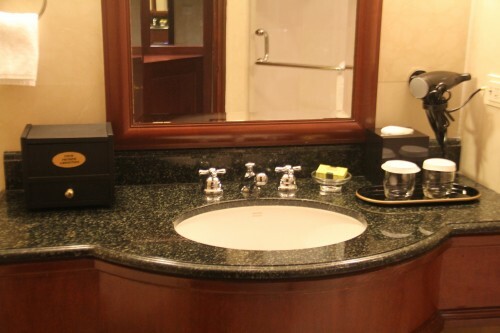 The bathroom was clean and bright with a walk-in shower, separate tub, and a single dark granite vanity counter. 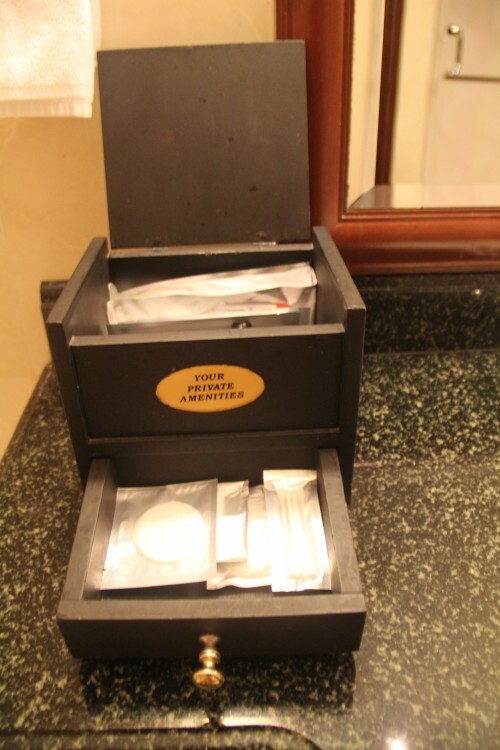 The amenities were enclosed in a black box on the counter that included basic toiletries. 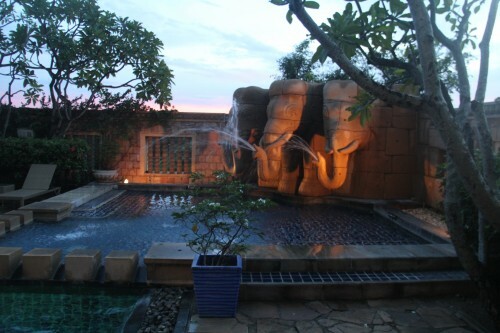 One of the highlights of the hotel was the terrace pool on the 3rd floor, lined with small trees and had an elephant fountain featured in the corner that blew water out from their trunks. 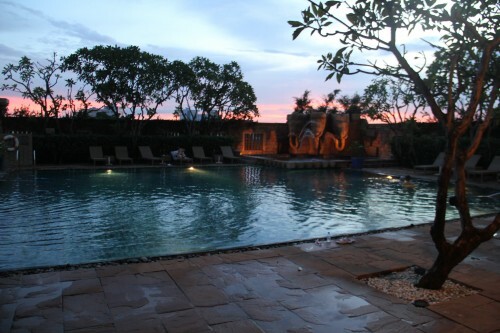 I didn’t spend any time during the day swimming since I was out and about, but at sunset the pool was a great place to take a dip. 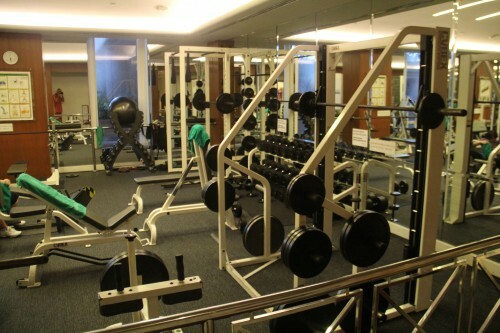 If you want to workout during your stay, the hotel has a sizable gym with a handful of exercise machines, weight equipment, and a small wood-floored dance room that converted into a table tennis room. 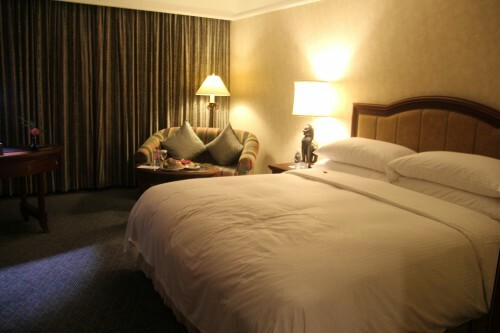 My stay at the InterContinental Phnom Penh was overall good—nice room and good service—but nothing special. 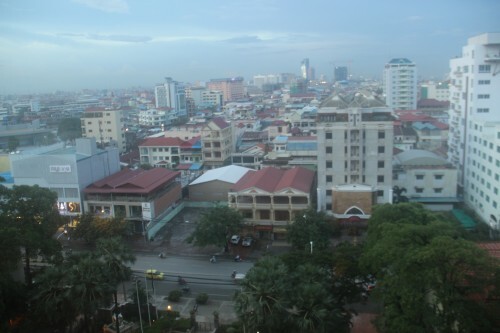 Of course grabbing it on a BRG there is little to complain about and I would recommend it to anyone looking for a upper-tier hotel while staying a few nights in Phnom Penh. Have you stayed at the InterContinental Phnom Penh? And if so, what was your stay like?